On a windy, chilly spring morning at Flemington, the 2013 Myer Fashions on the Field enclosure was officially launched, gathering designers, milliners, VIPs and the interstate and People’s Choice Award finalists to celebrate the occasion. The interstate and People’s Choice Award finalists in the 2013 Myer Fashions on the Field. This year, the upstairs Myer Fashions on the Field enclosure has been expanded and now includes a two-storey viewing area that is open to the public. Guests were welcomed to the enclosure with a fashion installation featuring models posing on podiums, dressed in current season racewear from Myer. A model wears racewear fit for Derby Day from Myer. While the viewing of the Fashions on the Field competition may be a bit tricky in some spots, I dare say it’s the best public viewing of the racetrack as well as the fashion (punters take note!). As a bonus, should the weather take a turn for the worst, it’s shielded from the elements with a roof to keep any rain away. The downstairs area remains similar to previous years with seating on each side of the stage. If you wish to grab a seat to see the fashion action I’d suggest arriving early, as I think with such great viewing in a prime position on the lawn there will be a battle for the limited seating. The new two-storey Myer Fashions on the Field enclosure. Dom Bagnato, Kris Smith and Melissa Hetherington discuss men’s racewear. Myer Fashions on the Field ambassador Rebecca Bramich and Myer milliner Natalie Bikicki gave some hints for the Women’s Racewear competition, and talked us through some of this season’s millinery and fashion trends. Natalie says “structural headwear” is the latest look in millinery right now, but cautions wearers to be mindful that their headpieces don’t “eclipse” them. Rebecca stresses the importance of following key trends, but also wants to see competitors “project their personality into their outfits”. Lisa and I were lucky enough to speak to Myer CEO Bernie Brookes following proceedings. Accessible and approachable, unlike so many other CEOs, Bernie is also an unlikely but very keen Fashions on the Field fan and is a regular front-row fixture at the events. 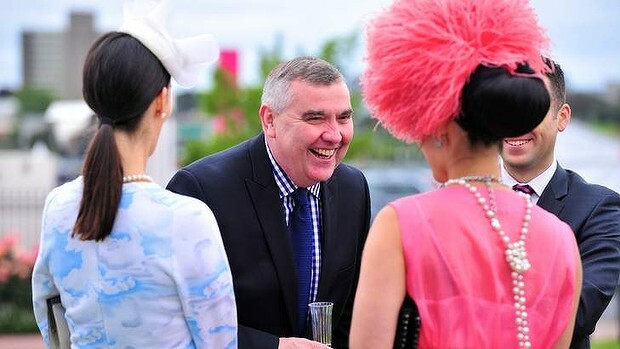 He takes Fashions on the Field very seriously – so much so that he’s known to make bets on the competition with Brian Levine, putting in $20 each and listing their first, second and third selections in their racebooks (Bernie successfully picked Angela for the win in 2011). The Myer boss admitted he is currently $20 down, but is confident of making up for it during the Melbourne Cup Carnival. He also divulged his favourite of the finalists so far but, as he is a man of great influence, we’ll keep it hush-hush so none of the judges are swayed by his thoughts! Lisa and Angela talk Fashions on the Field with Bernie Brookes. Photo from www.smh.com.au. He also spoke of how important Fashions on the Field is to Myer, revealing the Friday before Derby Day is their busiest Spring Carnival retailing period, selling one hat or fascinator for every minute the store is open. A staggering 21,000 dresses are also sold at Myer each year during the spring racing months, meaning Myer is definitely a crowd favourite in the fashion stakes.